Last week (February 8), thanks to Unite campaigning, Rolls-Royce took the unprecedented step of adopting the union’s period dignity charter – now, toilets at Rolls-Royce facilities in 50 countries across the globe will stock their toilets with free sanitary products. This big victory for Unite’s period dignity campaign has been won alongside a series of smaller but no less important successes. This week, we spoke to Unite women’s and equalities officer for the London & Eastern region Carolyn Simpson, who describes how her region has made major strides forward with the campaign. Carolyn teamed up with Unite branch secretary Ruth Hayes who works at a legal aid centre to help some of society’s most vulnerable women. “This legal aid centre specialises in representing women who are escaping prostitution, drug abuse, human trafficking and modern-day slavery – they often have absolutely nothing but the clothes on their backs,” Carolyn explained. 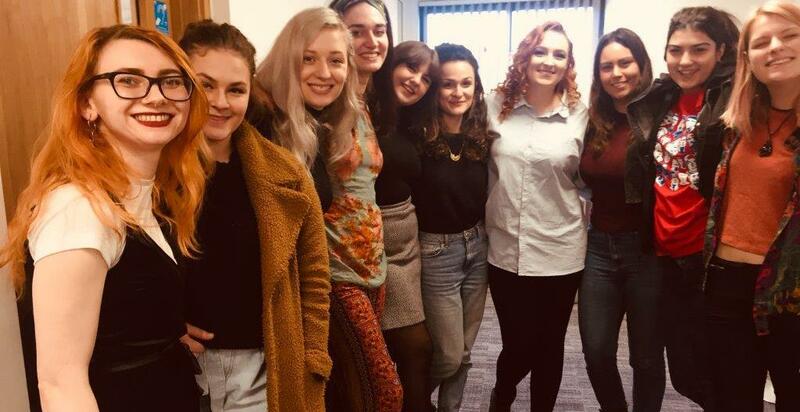 The region’s Moreland Street office in London now has a box in reception, where people can donate pads, tampons and other sanitary products – Ruth periodically collects the box and distributes the products to these women who most desperately need them. Carolyn reports that thanks to the campaign, every office in Unite’s London & Eastern region has free sanitary protection available in all their women’s and disabled toilets. So too, does Unite’s Esher Place, where much of the union’s training is hosted, as does Unite’s The View Hotel in Eastbourne. Carolyn said that she is also circulating a petition to end VAT on sanitary products – also known as the Tampon Tax – at every meeting she attends. Although Parliament first voted to scrap the Tampon Tax in 2016, two years later, women across the UK are still waiting for action – the government has said eliminating the 5 per cent VAT on sanitary products, which are currently taxed as ‘luxury items’, is now being stalled at the EU level. Carolyn told UniteLive that while in many ways the period dignity campaign has been taken up with great enthusiasm – “I’m pushing on an open door,” she says – there are still challenges. “Central to the campaign is getting people to talk about menstruation without embarrassment. While much has changed over the years, having those conversations still can be a struggle. For example, we have to understand how we navigate culture sensitivities when some cultures may deem menstruating women to be ‘unclean’. “Men too are still uncomfortable about it,” she added, recounting how one man who wanted to donate to the legal aid centre box at reception of Unite’s Moreland Street offices said he simply couldn’t go to a shop and buy tampons and so donated cash instead. Employers too don’t always ‘get it’ either, Carolyn said as she told of one Unite colleague who successfully got an employer to sign up to Unite’s period dignity charter. When this colleague went back to the employer to see if they were abiding by the charter, the free sanitary products were nowhere in sight. When asked, the employer said they were kept in a black box in reception because if they were put in toilets “people would take them”. “Well, obviously that’s the point!” Carolyn said. Carolyn said that the period dignity campaign can and should go beyond the confines of the workplace. She said she’s aiming to campaign around sexual health clinics offering free sanitary products in the same way they offer condoms. She believes that trade unions should play a central role in promoting period dignity because it is, above all, a workplace issue. Find out more about Unite’s Period Dignity campaign, and how you can get involved here.